They started the night as outsiders, but ended up occupying the winner’s circle. 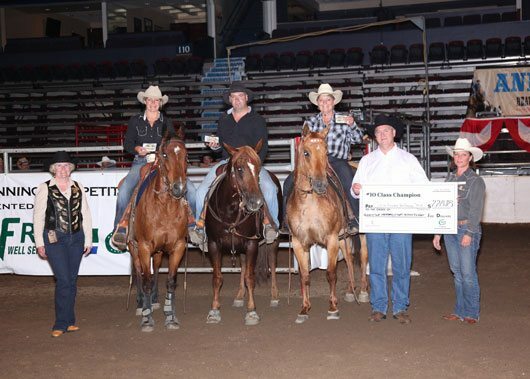 Steve Sigouin, Deja Iannone, and Katy Kosinski earned everything they got – and then some – on Saturday night at the Pengrowth Saddledome, beating very long odds to win the Calgary Stampede’s 10 Class Team Cattle Penning Competition. From left, Deja Iannone of Abbotsford, B.C., her husband Steve Sigouin, and Katy Kosinski of Williams Lake, B.C., captured the 10 Class final of the Calgary Stampede’s Team Cattle Penning Competition on Saturday night at the Pengrowth Saddledome. Their winnings totaled a whopping $22,878. Calgary Stampede photo. The British Columbia trio had fought hard just to make it out of Wednesday preliminaries in Okotoks, where a whopping 186 teams had thrown their hats in the ring. And starting Saturday’s proceedings at the Saddledome, they stood 15th among the 20 teams left standing, with a good 19 seconds and change to make up on the leaders after the first two rounds. But Sigouin, Iannone and Kosinski methodically stopped the clock in 31.71 seconds during the third round, which allowed them to advance directly to the 10-team final. From there, they laid down the fastest time of the night – 26.80 seconds – to take over the lead. And, finally, they watched for several anxious moments as the final five teams tried in vain to match their challenge. Suddenly, the winners’ cheque of $22,878 was theirs. Simple, right? “I didn’t believe it. I was having trouble believing it. And I still don’t believe it,” grinned Kosinski, of Williams Lake, B.C. The West Coasters’ winning aggregate time for 12 head of cattle was 130.12 seconds, and their margin of victory was slim – just 0.45 seconds over the runner-up squad of Hugh McPherson of High River, Alta., Robbie McKay of Okotoks, and Chris Baczkowski of Claresholm, Alta., who took home $15,252 for their efforts. “We’ve been talking about how important it is to get the cows in the pen as quickly as we possibly can. If we take one more step, if you don’t jump in when you need to, we might not have won tonight,” said Sigouin, who rides Blondie, a 13-year-old quarter horse mare. “We kept it together, and that’s what it’s all about when you come here. With the (Saddledome) crowd, and the loud cheering, you can’t hear each other, so you’ve got to trust each other,” he said. Team Cattle Penning, a race against the clock, gives a team of three riders on horseback 60 seconds to separate three specifically identified cattle from a herd of 30 and direct them into a 16-foot-by-24-foot pen at the opposite end of the arena. Teamwork is key, with all three riders working in harmony to cut out the correct cattle and drive them to the pen. All three members of Saturday’s winning team earned their maiden Stampede championship buckle, although Kosinski has been a winner before in Calgary at the Canadian Team Cattle Penning National Finals. The third round and final of the Open Class, the highest caliber Team Cattle Penning competition at the Stampede, will be held at 5:30 p.m. on Sunday, July 11 at the Saddledome. The third round and final in the 7 Class begin at 5:30 p.m. on Monday, July 12, also at the Saddledome.